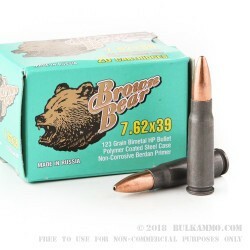 For new, non-corrosive, and effective ammunition for your AK or SKS, look no further than Brown Bear ammo from the renowned Barnaul Machine Plant in Russia. 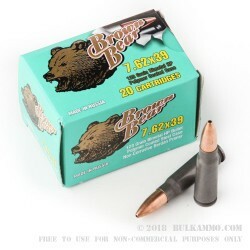 Priced suitably for either hunting or range use, this 123-grain hollow point boasts a muzzle velocity of 2,460 feet per second, powerful enough to take deer effectively at short and medium ranges. 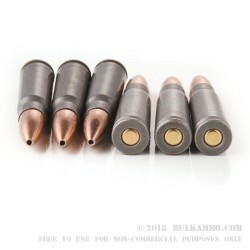 This ammunition uses non-corrosive Berdan primers and polymer-coated, nonreloadable steel casings. Warning: This ammunition has some magnetic properties due to its bimetal jacket, so try not to shoot it around any giant magnets, or in ranges that ban magnetic ammo. Barnaul Machine Plant has produced ammo for over 150 years, serving as a supplier to both the Russian Empire and the Soviet Union. During World War II, half of the cartridges used by the Soviet forces on the Eastern front were from Barnaul. The company gets its name from its present home, the city of Barnaul, where the ammo plant was evacuated in 1941 as invading Wehrmacht forces neared Moscow. Currently a closed joint stock company (somewhat similar to an American S-corporation), the plant currently specializes in shotgun and rifle ammunition as well as target practice devices.